Going to fly on the 2002 300-way Record Attempts was something I had to do. 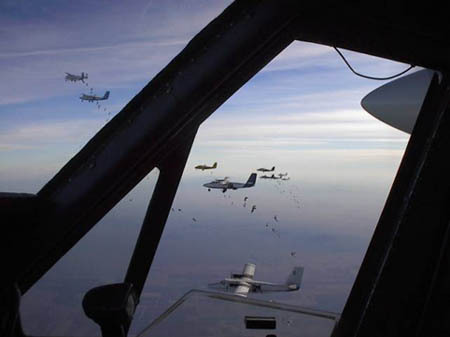 When I heard that the attempts were being moved from Brazil to Eloy, AZ and they were going to use multiple small planes rather than the big C-130s I knew I had to be on it. I was a pilot on the record 246-way in 1998 at Skydive Chicago and the thought of getting into an aircraft formation larger than the 12 aircraft formation we used then was very inviting. 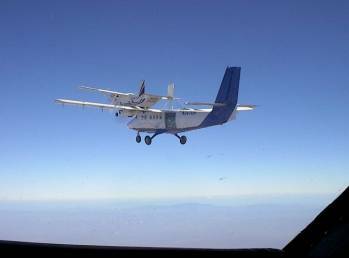 I originally asked Pat Patton (Skydive Arizona Director of Flight Operations) if he needed any more experienced formation pilots to fly on the big-way. He told me they had enough pilots for SDAs aircraft but that Roger Nelson might need a pilot for his aircraft that was going to participate. I immediately went to Roger and in about a 30 second conversation I was slated to fly on the attempts. The next part was getting permission from work at my airline to take a leave of absence during the attempts. Not an easy thing since most coveted vacation periods are during the month of December. But, after some pleading (begging) they granted my request and I was fully confirmed for going to Eloy. December 6th. I showed at Skydive Chicago early in the morning at 3am. Sorry Donovan. Donovan had the plane all gassed up and loaded with what we would need during the week. Extra oil cans, spare parts, and log books. I through my stuff on and met up with Skydive Arizona pilot John Schulz who was also headed to Eloy to fly on the attempts. The weather looked great for a night flight and air traffic was light. Only the occasional check hauler or FedEx flight was heard. With a quick refuel in Salinas, KS at Flower Aviation (good cookies) and then again in Las Vegas, NM we were arriving on the doorstep of Skydive Arizona about noon. While inbound I heard N220EA (Roger’s other plane) arriving ahead of us from Florida. They didn’t have as much luck on weather as I did. They had to go through some not so nice thunderstorms in Florida and Texas. After arriving the first order of business was to get the planes jump ready with oxygen and to take the hard doors off. After flying Otters for so long it always looks funny when we travel with the regular doors on. Something is just not quite right with the picture. Friday night we had our first pilot meeting. I looked around the room and we had six pilots who had previous world record large formation flying experience. Doug Evans, Eric (skyvan), Steve Stewart, John (Johnny Long Spot) Schulz, Jason (Skydive Oregon), and myself had flown on the 1998 record or 2000 attempts at Skydive Chicago. On Saturday we added Karl from Skydive Elsinore and that brought the total to seven pilots with previous big way formation flying experience from the 1998 or 2000 attempts. This was starting out to be an excellent group of aviators. Then around the room we had Geoff Ferrington from Kapowsin; Steve Boyd from Skydive Spaceland; Sven from Skydive Dallas; Lance from Skydive Oregon; “Stretch” from Lodi, CA; Rob from Perris, CA; and Sean Hill from Skydive Arizona. This was going to be a cake walk right? Wrong! We were going to have just as steep a learning curve as the jumpers were if this record was to be successful. Saturday started with five ship formations so that we could get our feet wet again in formation flying. This was also so the jumpers could start getting used to their other jumpers as well. We rotated through the group so that all planes would get a chance to fly at least one high load to 20,000 feet to test the oxygen system. 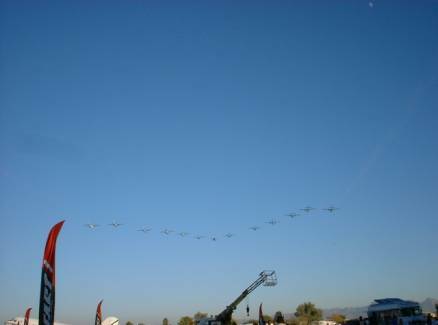 We didn’t want to find a problem on the first actual 14 aircraft formation. That would be a very expensive abort. We worked out the minor issues of aircraft placement during jump run and logistics for turning on, regulating, and turning off the oxygen system while in flight. Even though it was not necessary, we also practiced the formation takeoff using both the runway and the parallel taxiway like we would come Monday morning. It was almost like a drag race. I took off on the left side most of the time and it was a bit surreal to see the scenery zooming by but this one object next to you didn’t seem to move at all. Climbing to altitude was a hoot as we all wanted to show how excellent pilots we were and how tight we could fly. This, of course, led to the word coming back that some aircraft were TOO close and needed to loosen up a bit because jumpers didn’t have much room to maneuver down to the formation. No problem. We were there to put the aircraft wherever they were needed. Monday. Game Day. It was time to show how good an aviator we all thought we were. Well, we just about got our booties handed to us. The plan was to have the first five aircraft (skyvan and four otters) fly your typical 45 degree angle down and to the side formation. But then the formation was to straighten out as it got wider. They wanted us to fly with the nose of our aircraft even with the tail of the plane we were following. It is almost a line abreast formation and most of us have never had to fly a formation this way before. Another effect of this type of formation was that when we turned the formation on the way to altitude the aircraft that were on the inside of the turn had to slow down considerably. The wider you got the shorter the turn radius had to be to stay in position without shooting past the lead aircraft. Well, when you consider that we were flying at max gross weight for takeoff (11,600 pounds) and we were flying in the thin air above 20,000 feet there isn’t exactly a whole lot of performance margin available. Any little bobble or over controlling was quickly revealed and amplified as the wave went down the line to the outer edges of the formation. Several times the aircraft on the inside of the turn were having to make large power changes to keep from shooting past the lead and yet not fall out of the formation. Making up altitude and distance behind the formation is very difficult at altitude.The picture on the right was taken after I had to switch from my normal slot of left, left trail to right, right trail. When the jumpers boarded they got on the wrong planes. Three aircraft had to switch slots in flight. Everyone kept cool and we just talked it out so that we could all move around and get in position. I’ll never forget the look on the closest jumper’s face when I asked what plane they were supposed to be on. She said “Right, right trail!” I told her “But you’re on the left, left trail!” She looked confused so I told her to sit up and look my front window as to where we were. She looked out and said “Oh ****!” No problem. That’s what we’re here for. We’ll put the aircraft where you need them. Saturday and Sunday went very well as we worked out the bugs and the organizers got to see how we performed in our slots. They were still making their final decisions on who was going to fly where in the 14-ship formation. As to how they arrived at their final decisions I really don’t know. But, Sunday night we had the briefing and I was assigned left, left, left, left, left trail. Jump 2 was my call sign and Otter “B” was my jumper assigned name for the aircraft. While it may seem obvious to any pilot that one aircraft is very different from the other, the jumpers needed a way to positively identify the aircraft they were supposed to be on. Red vinyl letters were put on the nose area of each aircraft so the jumpers could easily identify it. We couldn’t afford to have aircraft misloaded during the 14 ship formations. In the first nights briefs I made mention that we were NOT the show. We were not to be noticed by the jumpers. 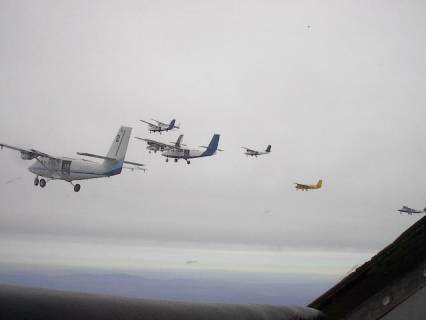 We were necessary to get them to altitude but if the aircraft formation became a distraction there was going to be no record. Well, on this first day of the 14 aircraft flying together, we were noticed. It was a rough ride and a distraction to hear the engines spool up and down over and over. We pre-briefed each load and debriefed after we put in our fuel and oxygen orders to the ground support. From the first to the last load of the day we made major improvements in technique. But we still weren’t satisfied. The goal is to fly NORDO (NO RaDiO). When everyone is doing their job and flying smoothly the formation frequency will be silent. And we needed some work to achieve this goal. The end of day pilot meeting was very spirited. We are all professionals and we are all perfectionists. A lot of good things came out of that meeting and I will leave it at that. This is the view out of my window. As you can see, there is whole heck of a lot of metal up there. From left to right the aircraft are Skydive Chicago 220EA, Skydive Oregon OX, Perris Valley “Shark Air”, the other Skydive Oregon Otter, Skydive Arizona Skyvan, Lodi’s Otter PV, Skydive Dallas “The Short Bus”, and Kapowsin’s Otter. Remember, there are SIX planes not shown in this photo including mine. And you can see how wide we get on the inside of the turn being so far on the left side of the formation. Each successive load got better through the climb. My plane captain (jumper in charge and go between for the pilot and skydivers) was Kate Cooper. 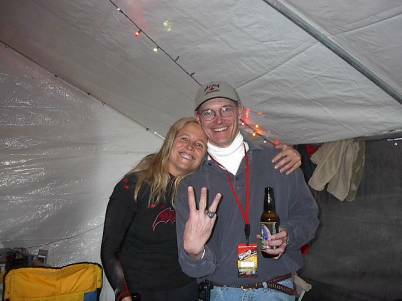 For those who don’t know her, Kate has been a skydive organizer for a long time and was the force behind the Jump For the Cause all women’s large formation skydive world record in 1999 and 2002. She sat in my right seat to operate the oxygen system and to watch the other aircraft in the formation. She was a tremendous help. 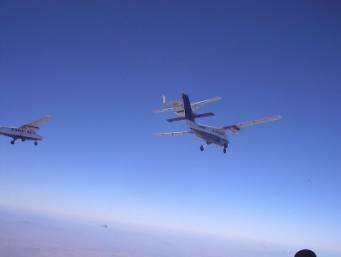 It isn’t easy flying a line abreast formation while sitting on the left side of the aircraft. You have to look through a small site view (window on far side of aircraft) and still pick up on the cues that tell you when you are drifting closer or farther away from the aircraft on your right. What made it easier was to go and fly referenced to one of the aircraft in the base 5-plane formation and just leave a wide enough gap that the other aircraft could come up in their slot if they happened to fall behind for a bit. This greatly reduced the stress on us and dampened the waves were experiencing in the beginning of the week. Kate did an excellent job calling out the other aircraft’s positions when they fell behind since she had a good view from the right seat. Thanks Kate. See picture below. This was taken just after we built the first complete 300 person freefall formation. And yes, I was done flying for the day before drinking that beer. The record formation: What can I say? It was perfect. It was the last load of the day on Thursday the 12th. The last load of the day had been a problem for us because of sun angle and jump run direction. So I guess it was only fitting that this was the load we accomplished the impossible. It was the world record and it was a perfect spot. Way to go Eric! For jump pilots out there, we weren’t running into the winds aloft for the lowest groundspeed possible. We were actually running downwind because of the sun angle. The crowd on the ground got an eye full to say the least. And when they all opened the people on the ground could hear the cheering because they all knew they had just done it. Norman Kent got on the ground cheering and telling people that he didn’t see anyone low and everything looked complete. Pat Patton called up to the aircraft as we were still descending and said “I think we’re drinking champagne tonight boys!” Oh yah! That only meant one thing. FLY BY!!!!!! We descended with the formation intact rather than splitting it as usual. 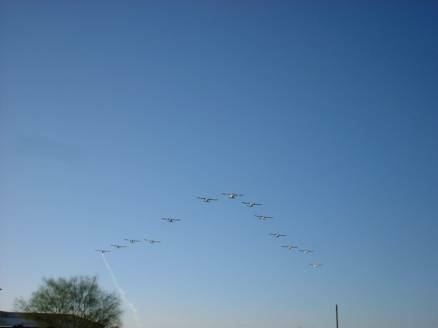 We looked like a big flock of geese headed south for the winter. My girlfriend Renee took the photos. I noticed something very striking though. The picture with the formation headed towards the camera is impressive. But the picture with the formation going away just seems to show how big this formation really was. We pulled off the impossible formation to build the world’s largest freefall formation with a perfect spot. And yes, that is smoke coming out of the otter on the far left. It’s intentional so don’t worry. In top photo I am the second from the right. And in the bottom photo I would be the second from the left. Thursday night there was a lot of celebrating as you can imagine. The plan was to come back at noon on Friday to go for bigger than 300. Only 2 people did not show from the dive the night before. The willingness was there. The additional jumpers were there and ready. The pilots were standing around waiting. But the organizers decided that in the interest of safety it was best that they not make any jumps that day. There was a bit too much partying the night before to put up an attempt. So, the jumpers did more dirt dives (practicing on the ground) because they are free and the rest of us scattered. I got to make a couple of fun jumps myself and relax. We certainly did need it. Saturday came with the intention of breaking the 300-way record. But you could tell there was a change in the atmosphere. I knew the edge had been dulled a bit even if people wanted to do it, the 328 was potentially going to be harder to make than the 300-way. Getting that many people focused and staying focused together is a darn near impossible thing. That’s why the 300-way has stood unbroken for so long. Many have tried and records have been broken along the way from the 200-way set in the early 90s. “If it was easy then no one would want it because everyone would have it.” –Roger Nelson. That’s why we keep coming back to this record because it IS hard. Logistically, physically, and mentally, this is one of the hardest things to do in aviation. It requires so many people doing things perfectly.